Please note: The DIL/NetPC PNP/1110 is in an end-of-life (EOL) state. For more information about availability and the DIL/NetPC PLM (Product Lifecycle Management) please contact kge@ist1.de. The DIL/NetPC PNP/1110 provides a very compact Intel 206 MHz SA-1110 StrongARM-based low power embedded controller with TCP/IP stack and web server for network-based or mobile embedded user interface applications. The DIL/NetPC offers the footprint of a standard 169-pin PGA socket with 2.54mm centers and all the hardware and software features necessary to add high-speed networking capabilities to any product design. The DIL/NetPC PNP/1110 was developed specifically for industrial user interface products that need to be driven by high-resolution graphic LCD with minimum development costs. The PNP/1110 comes as ready-to-run system for GUI (graphical user interfaces) applications. Just connect a high-resolution LCD and run the pre-installed Linux-based X server, that is all. The use of the PNP/1110 will allow you to realize a substantial time and costs savings over other chip- or board-based approaches. Currently, there is no other solution with more development time savings on the market. There is also no faster Time-to-Market for your industrial GUI-based product. To interface the PNP/1110 with existing devices and equipment, the PNP/1110 offers two asynchronous serial RS232C interfaces with TTL levels and handshake signals (COM1/COM2 - 16550 compatible), 18-bit general purpose high-speed parallel I/Os and a 32-bit high-speed expansion bus with interrupt inputs and chip select outputs. There are two ways for PNP/1110 integration: 1. Adapt the PNP/1110 to your existing product. Use the existing I/Os within your product to communicate with the PNP/1110. 2. Use the PNP/1110 to control and monitor the hardware of your existing product. This might enable you to replace your existing controller entirely. In a new product design, the PNP/1110 can be the main controller. Additional I/Os are driven by the 32-bit high-speed expansion bus. The on-board FLASH memory provides storage for the PNP/1110 operating system with TCP/IP stack and embedded web server as well as OEM applications and data. The FLASH memory is in-system programmable over JTAG, serial and the Ethernet interface. The boot block of the FLASH memory is only in-system programmable over the JTAG interface through a special cable attached to a PC parallel port. For all other FLASH blocks, you can use also a high-speed serial connection through the PNP/1110 COM1 port or the 10/100 Mbps Ethernet interface for in-system programming (networking version only). The PNP/1110 in-system programming was developed for OEM application software, operating system downloads (i.e. upgrade from embedded Linux to eCos) and data download and to make it easier to update the on-board FLASH content in the field. The PNP/1110 is build around the Intel StrongARM SA-1110 32-bit RISC microcontroller running with 206 MHz. 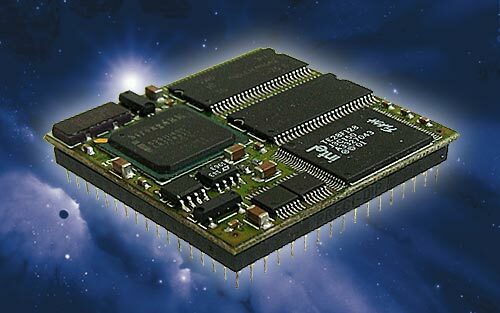 The SA-1110 has a large instruction and data cache, memory-management unit (MMU), and read/write buffers. The SA-1110 offers high-performance processing power with up to 235 Dhrystone 2.1 MIPS. The SA-1110 CPU core implements the ARM V4 architecture as defined in the ARM Architecture Reference Manual. The SA-1110 provides a complete set of internal peripherals. There are multiple serial communication channels, general-purpose I/O ports, timers, interrupt control, reset control, LCD controller, PCMCIA interface logic, and power management functions. The external main components around the Intel StrongARM SA-1110 32-bit RISC microcontroller on the PNP/1110 are one FLASH chip with 16 MBytes, two 32 MByte SDRAM chips (64 MByte total SDRAM), and one 10/100 Mbps Ethernet LAN controller with 10BASE-T and 100BASE-TX physical layer interface (PNP/1110 networking version only). The FLASH stores the hardware setup code, the SSV Flash Loader, the boot loader, operating system, and OEM applications. The SDRAM access and the refresh operation is driven by the SA-1110 integrated SDRAM controller. The PNP/1110 10/100 Mbps Ethernet controller is a SMSC LAN91C111 single chip MAC+PHY. This highly-integrated Ethernet LAN controller of the PNP/1110 networking version includes 8 KByte internal memory for receive and transmit FIFO buffers, a IEEE 802.3/802.3u Ethernet MAC engine, and internal 10BASE-T and 100BASE-TX transmit and receive filters. The SMSC LAN91C111 supports full-duplex switched Ethernet operation and auto negotiation for 10 and 100 Mbps. For the PNP/1110 LAN integration, the PHY interface needs only a external low-cost isolation transformer. The mechanical interface between the PNP/1110 and existing devices and equipment is a JEDEC 169-pin PGA connector with 2.54mm centers. This allows the direct integration to a standard 169-pin PGA socket. The 169 pins in total are used for 3.3 volt power supply (32 pins, including Vcc, GND, Vbat ), Reset in and out (2 pins), two serial interfaces (4 pins), 10BASE-T and 100-BASE-TX Ethernet interface (4 pins), general purpose parallel I/O (18 pins), JTAG (5 pins), LCD interface (20 pins) and the 32-bit expansion bus (79 pins, including chip select outputs, interrupt input, clock output and PC Card dedicated pins). The DIL/NetPC PNP/1110 provides the dimensions of a standard JEDEC 169-pin PGA socket and will be delivered with a preinstalled embedded Linux operating system (kernel version 2.4), X-Server for Linux, TCP/IP stack, thttpd embedded web server, FTP server for file transfers to and from the PNP/1110, and a Telnet server for remote login via Ethernet. There is also the SSV Flash Loader preinstalled for update the operating system components (kernel and/or root file system) or download a other operating system image file to the on-board FLASH. The module is based on a Intel StrongARM SA-1110 32-bit RISC microcontroller. This processor runs with 206 MHz clock. There are 64 MByte SDRAM and 16 MByte FLASH memory on-board. Two serial interfaces (COM1, COM2), LCD interface, 18 digital I/Os and one 32-bit high-speed expansion bus with chip select output signals and interrupt input signals offers the interface to higher level systems and devices by using the standard JEDEC 169-pin PGA interface with 2.54mm centers. The network interface is made by a 10BASE-T/100BASE-TX Ethernet interface with embedded RAM for packet buffering and support for full-duplex operation and auto negotiation for 10 and 100 Mbps. As development support we offer a starterkit with PNP/1110, DNP/EVA4 evaluation board, VGA TFT LCD with cable and CFL inverter unit, 110-230 VAC to 5 VDC international power supply, nullmodem cable, CD-ROM, and user manual for the first steps. The CD-ROM comes with a full GNU cross tool chain for C/C++ software development. This binary files of the tool chain runs on a x86 Linux-based host (SuSE, Red Hat or other) and builds ELF binary files for the Intel StrongARM SA-1110 32-bit RISC microcontroller. PNP/1110-NV Networking Version with Intel 206 MHz SA-1110, Ethernet Controller and Firmware in FLASH, 3.3 VDC Vcc. PNP/1110-MV Mobile Version with Intel 206 MHz SA-1110 and Firmware in FLASH, 3.3 VDC Vcc. DNP/EVA4 Evaluation Board for PNP/1110 with 169-pin PGA Socket. DNP/SK6 Starterkit with PNP/1110-NV, DNP/EVA4, TFT VGA LCD, CD-ROM and Null-Modemcable.